chessbase has a "reprint" of an article which first appeared in "Chess". It's about the film by Alan Byron "Closing Gambit". One piece of new history might be this. Chess wrote: Just before what turned out be the crucial last game of the World Championship, Game 32, Ray Keene reveals for the first time what actually happened behind the scenes as the KGB broke all the protocols they had previously agreed and put pressure on Campomanes to make life as difficult as possible for Korchnoi and his team. Out of respect for a former FIDE president, Keene has previously not revealed the private conversation he had whilst Karpov was taking a time-out at the world championship basketball match in Manila (which the mighty Soviets embarrassingly lost in the last seconds to Yugoslavia). A behind-closed-doors conversation and offer made to Keene as the head of Korchnoi’s delegation was, he believes, a misguided attempt at diplomacy. Ray Keene is the only living person that bears witness to what happened that night, but events in a subsequent FIDE world championship match look to bear him out. 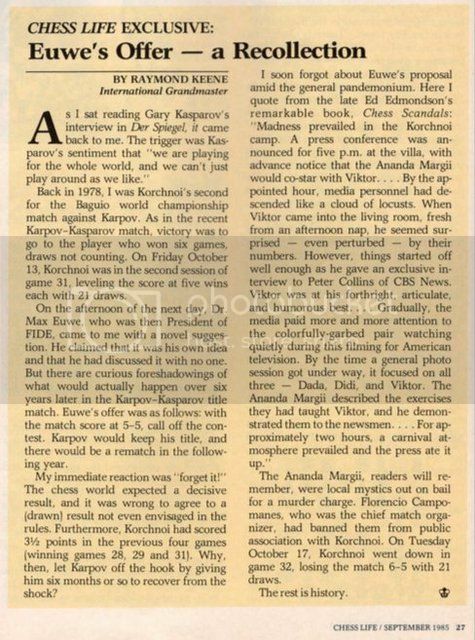 Korchnoi later alleged that the opening of game 32 had been leaked to the Karpov camp, but Korchnoi's treatment of the Pirc with c5 and Na6 wasn't an unknown idea, having been featured in passing in the early 1970s Keene & Botterill book on the Pirc. Neither was Karpov's response of playing the position for white as a semi-Benoni. Yes, I was also sure I had heard something like that before. Raymondo just getting forgetful in old age? Ray has always had an extremely reliable memory, except when he hasn't. Isn't that proposal of Euwe's identical in principle (though not detail) to what Fischer was insisting on as a condition for his never-held world title defence? FIDE voted the idea down in 1974; one wonders if they'd have really pulled a one-eighty and gone along with Euwe only four short years later. Assuming such a proposal ever existed.